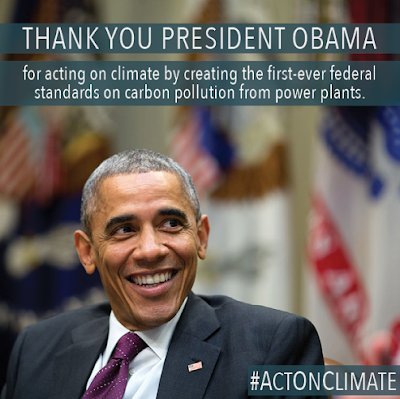 Today President Obama and the Environmental Protection Agency took a major step in the fight against climate disruption by releasing the Clean Power Plan. Until today, there were no limits on the amount of carbon pollution that power plants could dump into our air, wreaking havoc on our health and our climate. More often than not, the power plants spewing this dangerous carbon pollution have a disproportionately negative effect on low-income communities and communities of color already suffering from toxic pollution's worst effects, including heart attacks, asthma, and premature death. Cleaning up carbon pollution will help protect public health: Coal pollution in the United States results in more than $100 billion annually in health costs and more than 12,000 emergency room visits per year. Polluters are putting their profits ahead of people and the environment, and it’s time for that to end. Also important, by establishing carbon pollution protections, President Obama and the EPA are beginning the essential work of cleaning up and modernizing how we power our country. This creates jobs and boosts the economy. Several studies out recently show the positive economic impact possible with the Clean Power Plan. Americans strongly support this climate action, with polls from this year showing that nearly 70 percent of Americans across party lines support the Clean Power Plan. Regular Americans aren't just cheering this announcement -- they were the key to making it happen. In July,the Sierra Club announced the 200th U.S. coal plant retirement, and clean, renewable energy is at record levels. Grassroots advocacy made that happen and, as a result, the U.S. is leading the industrialized world in reducing carbon emissions. We are are on track to meet -- and even exceed -- the carbon reduction targets in the Clean Power Plan. "I am excited by how much the Clean Power Plan will benefit communities and families in the form of lower electricity bills, better health, increased clean energy, and more jobs," said Verena. "The American people overwhelmingly support these efforts. And to know how much work grassroots activists have put into getting this national climate action to happen -- it's thrilling to see yet again how much of a force the people can be when we work together." This is the U.S. taking the lead on climate action, and with the international climate meetings happening this fall in Paris, it is a powerful example for other countries to follow. Already, it's bringing other nations to the table with strong plans of their own. We applaud the EPA and the Obama administration for taking this strong step for people and the planet -- and I thank the thousands upon thousands of activists nationwide who have marched, rallied, protested, written letters, made calls, and so much more to demand serious climate action from our leaders.